Lately I have been struggling for ideas because I am torn between redoing recipes vs creating new ones. So I looked in my fridge and took an inventory of what I had on hand and then went off to the store. I had some deli ham that was on it’s last week and some broccoli. Recently I made a casserole that included chicken, broccoli and quinoa that turned out well so I decided to do something similar but different. Given I had the ham, my mind drifted towards Cordon Bleu. So this mutt of a recipe is one part Chicken Divan, one part Cordon Blue and one part Chicken Broccoli Rice. Also the pics aren’t great as I struggle with photographing a casserole. If they fall apart in plating, I just go zoom and call it a day. 1. Prep: Rinse your quinoa, break down your broccoli, mince your garlic and onions, open your cans, cube your chicken. Also create your breading/egg wash stations by taking two pie plates and in one fill it with seasoned Panko bread crumbs and the other with beaten eggs. 2. Preheat your oven 375 degrees. Also take a sauce pan on medium low heat and add your butter and onions and let them sweat until translucent. Add your garlic and cook for another minute. Next add your cream of chicken and chicken broth and stir until well combined. Turn your heat down and cut up your ham into bits and add it to your sauce followed by the quinoa. 3. Take a baking dish 9×13 size and spray it with your favorite oil. Now in about three batches add your chicken to the egg wash, shake and then add to bread crumbs and then directly to the baking dish. Once all your chicken has added top it with broccoli. 4. Now pour the sauce with the ham and quinoa in it. Poke it around to make your the sauce gets all over the chicken and broccoli. Top with your shredded Fontina cheese (I like Fontina because it melts well and has more tang). Hit it with some grated Parmesan. 5. Cook for 30 minutes covered with foil and then 10 minutes uncovered. The other night I tried a Paleo version of an Orange Chicken Stir Fry. Frankly it sucked and I won’t post it because I don’t post dishes that I wouldn’t make again. So I had some leftover broccoli, mushroom, asparagus and chicken. When I make an Asian dish I try to bookend it with some Jill prefers which is comfort, Italian, pastas etc. I knew that Orange Chicken Stir Fry missed the mark and to hear her make comments like “hmmmm” or “interesting flavors” while she picked through it like a monkey picking ticks of other monkey’s I knew I need to bring a comfort dish the next night. I was thinking of our chicken and rice, chicken divan and chicken spaghetti and thought I would make a hybrid. A while back I tried something similar that used quinoa but mine was a bit dry so I knew I needed to get some moisture on the bottom with some sauce. Casseroles and myself are not photogenic. So don’t let the pics scare you off. The sauce was terrific and really pulled it all together. For people who are repelled by vegetables this is a great way to get people to eat them because they are masked in cheese and sauce. Learned that from my Mom. 1. In a pot on medium heat pour 1 cup of chicken broth and add your chicken breasts and cook covered. It will take a 10-15 minutes. You can cut your chicken before poaching it to speed it up. I wanted to enrich my broth with the chicken breast so went the longer route. 2. Preheat your oven to 375. Take your casserole dish and add 2 tbs of butter and put it into the oven to melt. 3. Chop your veggies. When chicken is done remove to rest. In another sauce pot make a roux with flour and 2tbs of butter. It’s going to be pretty thick so slowly pour in your chicken broth. Just be careful because the broth is hot and you might make biscuits. Mine was actually lumpy so I put it in a blender. Slowly pour the milk in. Add your spices and mushrooms and stir until it thickens up. Taste and adjust accordingly. 4. At this point you have cut raw veggies, a sauce, a buttered dish and diced chicken. I took the buttered dish out of the oven and pour in the cup of quinoa and moved it around. I poured a little sauce to make sure it was well coated and moist. I combined my veggies and chicken and then poured them into the dish. 5. Then I poured sauce all over to make sure every nook and crannie was saturated. I used my spatula to much everything around well. Sprinkled grated Parmesan cheese and then top with fresh grated cheddar cheese. Covered with foil and cook for 20 minutes. Then remove the foil and cook another 20-30 minutes. Let is rest for a 5-10 minutes Serve and enjoy. Texas clearly values BBQ Brisket over any other protein. That said, I will try and enjoy it all and truth be told I probably go 50/50 on beef and pork. I also enjoy the vinegar that you find in the Southeast. So when I asked Jill what she would like this week, she said let’s do BBQ pulled pork sandwiches. For tonight I didn’t go all out with a coleslaw topping or anything but it’s always welcomed on a pig sammie. I did make a potato salad with two russets some mayo, sour cream, pickled jalapenos and green onions. I won’t include the recipe because I truly winged it. That said you can search my blogs for sides like potato salad or beans etc. After eight hours in the bath the pork can’t help but get fall apart tender. In fact, fishing it out of the crockpot was a challenge. I also like to add sauce only on the top of the mound of pork to let the pork shine. Always butter and griddle your buns until you get a nice brown “crunch” texture. 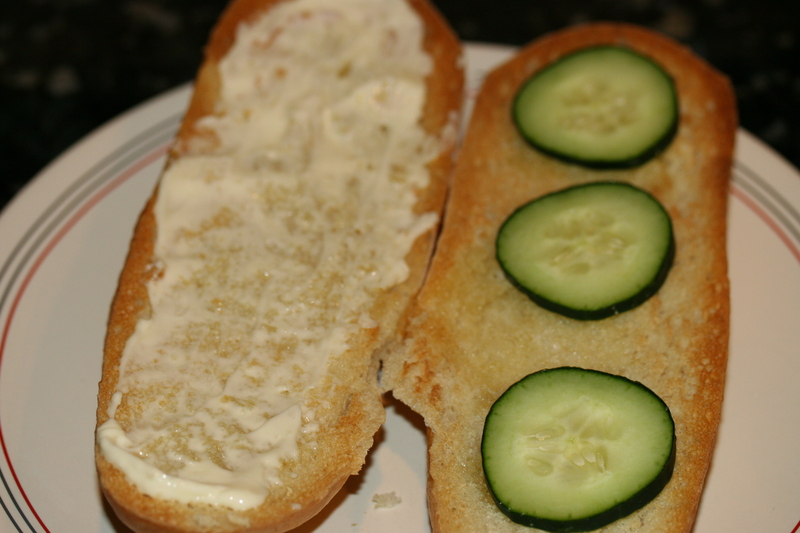 This will help it hold up to the moisture of the overall sandwich. Pinch of cumin and cayenne optional. 1. Take your shoulder and apply your dry rub and let it sit. You can let it sit overnight if you so choose. 3. Toast your bun, apply your pork and your favorite sauce on top. I picked up a bottle of Dreamland BBQ sauce out of Alabama. It’s a nice blend of Carolina and TX sauces. Serve with Beans, potato salad or whatever you like. See my side recipes for ideas. I wasn’t sure what to call this dish but when I spotted the Trader Joe’s pesto tortellini I knew Jill would love it A creamy Parmesan sauce was a perfect complement. Adding the chicken made it a more substantial mean but certainly not necessary. Also when I make a creamy sauce for my pasta I love adding peas because they add a pop of sweetness and freshness. Given I used packaged tortellini this is one of those restaurant quality meals that you can whip up in a flash. I used two chicken breasts but looking back I would just go with one because we couldn’t eat it all. For the sauce, I will try to remember how much I used of each ingredient but the more important thing for you to do is consider your tastes. Do you like a lot or light amounts of sauces? Do you like it thick or more loose. More cheesy or even use another cheese like Gruyere, swiss, maybe even blue cheese. hmmmm? 1. Let’s make some chicken. Season both sides with Kosher salt and Pepper. Put a little bit of oil in a medium heated cast iron skillet and cook it until done and make sure you get some nice browning. Remove your chicken and set it aside. 2. Turn the heat down medium low and splash in a little chicken stock or water (pasta water if you decided to cook your tortellini first, to deglaze the pan. Now add your butter and flour to get a rue going. Given the chicken bits are in your rue it will look darker but stir until you get a nice paste. Slowly pour in the milk stirring continuously. I let it thicken up a little bit and then added about a cup of finely grated Parmesan cheese. 3. Cook your Tortellini until al dente. I chose to pour my sauce mixture over the top versus incorporating them into the sauce with everything else. The reason is that I have had some ravioli or tortellini bust open on me during the stir. I just stirred it while in my bowl. Tonight I was feeling a little mexican sour cream chicken enchiladas but wanted to change it up and decided to create a casserole thing. It turned out like a spicy Chicken Divan minus the broccoli. This one is a super fast and easy comfort dinner. You could pull down the spice by reducing the jalapenos but Jill and I like to sweat a little when we eat. Prep: Shred chicken, grate your cheese, open your cans. 1. Take your favorite saucepan on medium low heat and melt your butter. Now stir in your flour and stir for about a minute or so. Add the milk and stir until it thickens just a bit. Add your cream of chicken soup, sour cream and your peppers and chilies. 2. Preheat oven to 375. 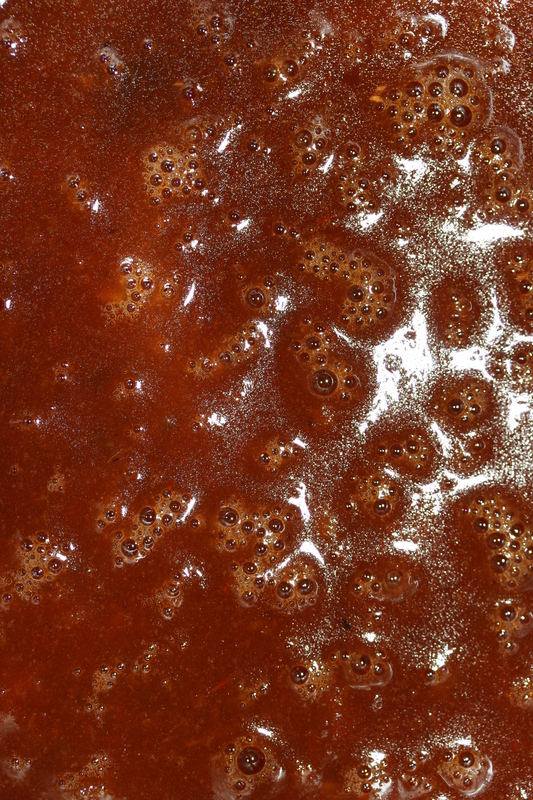 Put a little sauce down on the bottom of a glass dish. I made a small one since it was just the two of us. Place your tortillas on the bottom. I tore up about 4. Add your shredded chicken on top and then pour the sauce until everything is covered. Move it around with a spoon to make sure everything is coated. Top with cheese and cook until it’s bubbly and melted. Given that everything is basically cooked I let it go 30 minutes uncovered. Let it stand for 10 minutes or so. Serve and eat. Great for leftovers and even freeze worthy. 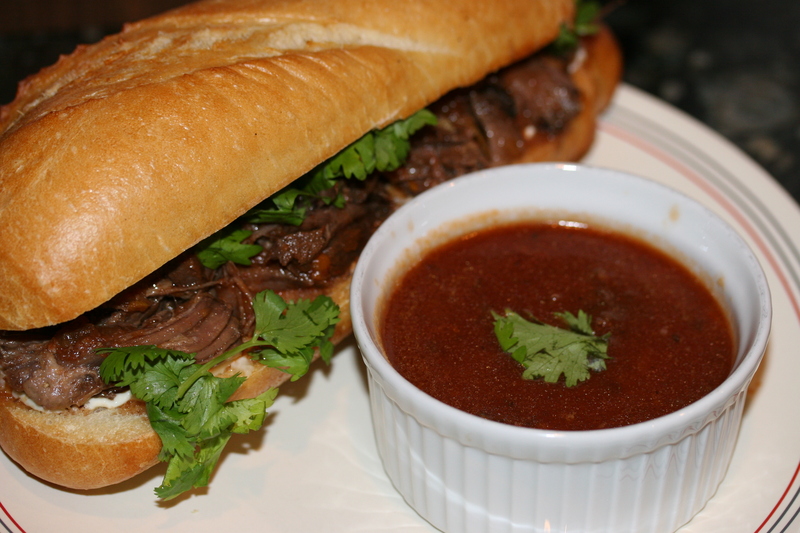 A while back I created a recipe titled Ginger Beef Ginger beef which a nod to Num Pang in NYC who serves up some mean sandwiches that people line up and wait for. So I basically looked at my recipe but really didn’t measure anything. This sandwich is a must try. 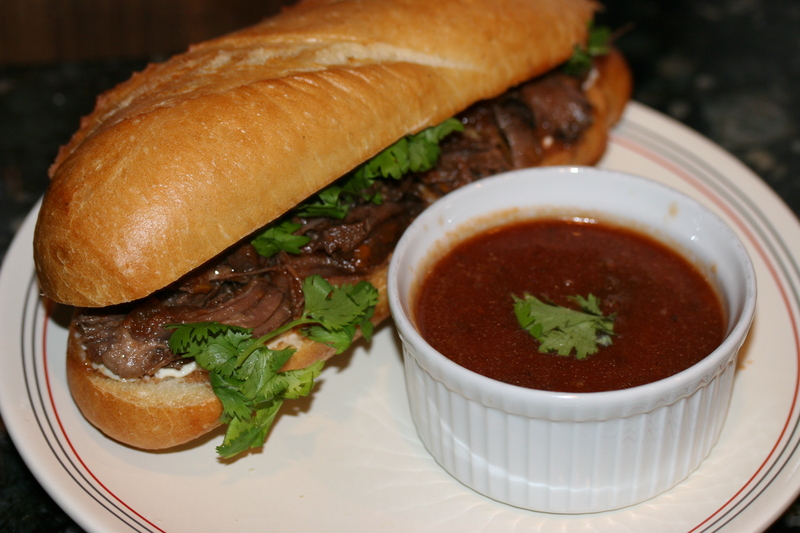 Think of the French Dip with an Asian/Thai/Vietnamese twist. It’s not overly “Asian” but only so due to the vinegar, soy sauce and ginger. That’s really it. Now the addition of the tomato sauce gives it a kick but it’s not Asian. I served it on a toasted French Baguette with cilantro, cucumber and a little Dukes Mayo. It’s messy, spicy, savory. I cooked the meat in the crock pot for 6 hours and it was fall apart, melt in your mouth tender which perfectly complimented by the chewy toothy bread. The veggies gave it a refreshing punch. I poured some sauce into a little side dish and used it to dip. 1. Cut and chop the veggies, add the meat and all the liquids except the tomato sauce. I cooked mine on high for 6 hours. 2. To make your sauce, add all the liquid plus the tomato sauce and some of the garlic and ginger to a blender. It’s hot so be careful blending hot stuff. Go slow and don’t close the lid all the way. Blend slowly until smooth. 3. 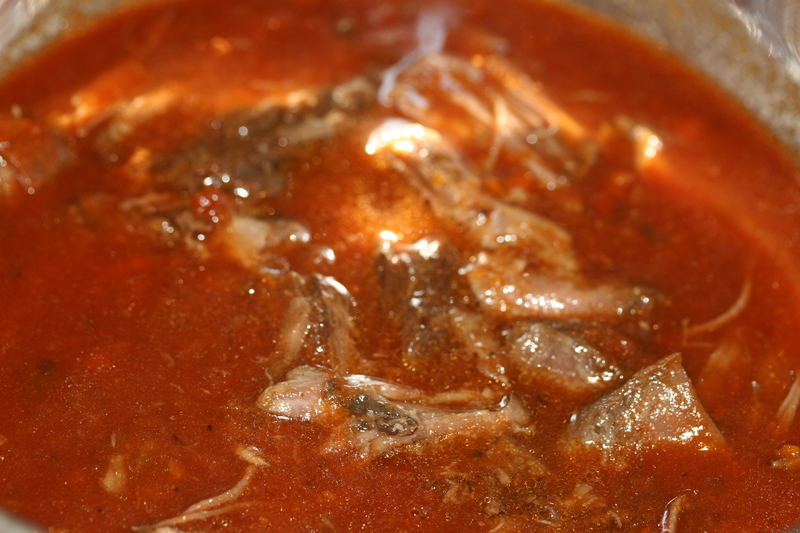 Now in a bowl take your roast beef and add your sauce to cover the meat. You want it nice and juicy. 4. Cut and toast your baguette until light golden brown. Put Dukes Mayo on one side and add you meat with your sliced cucumber and cilantro.